Last week, we began our digital photo organizing journey by designating our digital photo hub, and migrating all digital images that we’d like to include in our photo collection into that hub. This week, we will get a better understanding of the scope of our photo organizing project that lies ahead by creating a digital photo inventory of our collection. Think of this inventory as your “BEFORE” snapshot. As with any transformation, we sometimes lose sight of how far we’ve come until confronted with that BEFORE image, right? 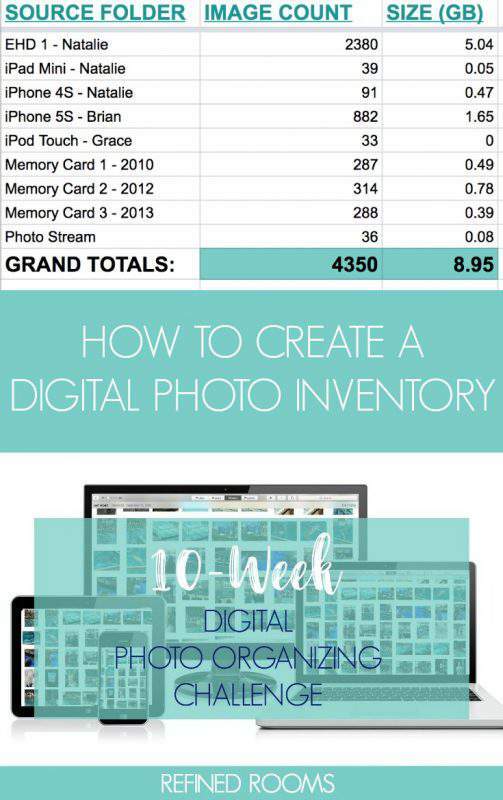 WHAT DOES A DIGITAL PHOTO INVENTORY CONSIST OF? Remember all of those sub-folders you created last week during the hub migration process? For each of those sub-folders, you’re going to record the number of images contained within the folder, as well as size of each sub-folder (i.e., the total number of gigabytes). WHY GO THROUGH THE TROUBLE OF CREATING A DIGITAL PHOTO INVENTORY? First, it provides a starting point for you to gauge progress. A huge part of the digital photo organization process is “decluttering” the collection (deleting poor quality photos and duplicates). It’s important to have that baseline snapshot of the size and quantity of your image collection so that you have these numbers as a basis of comparison after you complete the organization process (AKA your AFTER shot). Knowing the size of the collection can also help you to plan out an appropriate timeline for completing your organizing project. The timeline for organizing a collection that consists of 5,000 photos is quite different than the timeline for organizing a collection consisting of 250,000 photos! And knowing the approximate size of your digital photo collection is helpful when selecting backup tools and products, and setting up accounts on photo storage sites. 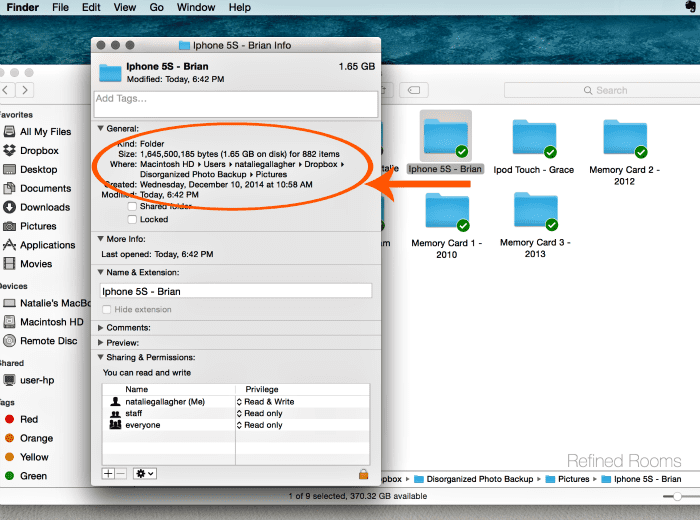 HOW DO I DETERMINE THE NUMBER & SIZE OF DIGITAL FILES? So hopefully, I’ve sold you on the merits of this baseline photo inventory thing. Now let’s talk logistics. 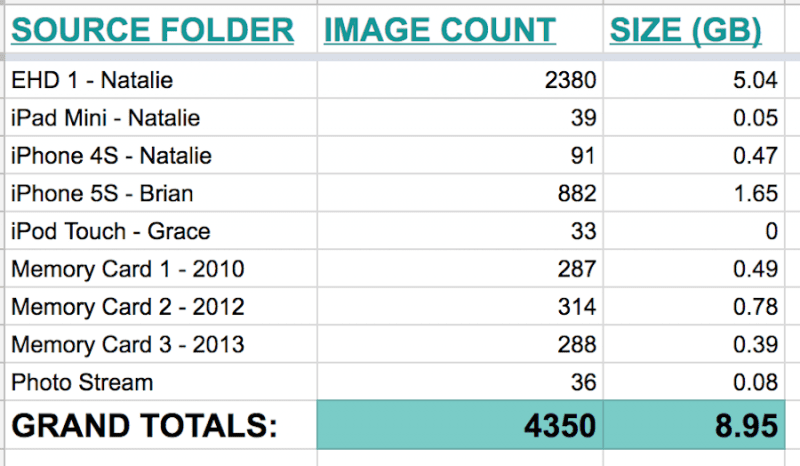 Create a simple spreadsheet containing three columns: Source Folder, Image Count, and Size (Gigabytes). In the Source Folder column, list all of the sub-folders you created last week as part of the digital photo hub migration process. Each folder represents an original image source. Don’t want to create your own? You can download a COPY of the one I use here. Need help gathering this info? No problem. If you’re a PC user, right click on each sub-folder and select “Properties” to get both an image count, as well as the size of the files contained within the subfolder. FYI, if you have folders nested in your main sub-folder, be aware that you will need to subtract the folders from the file count in order to get an accurate image count. 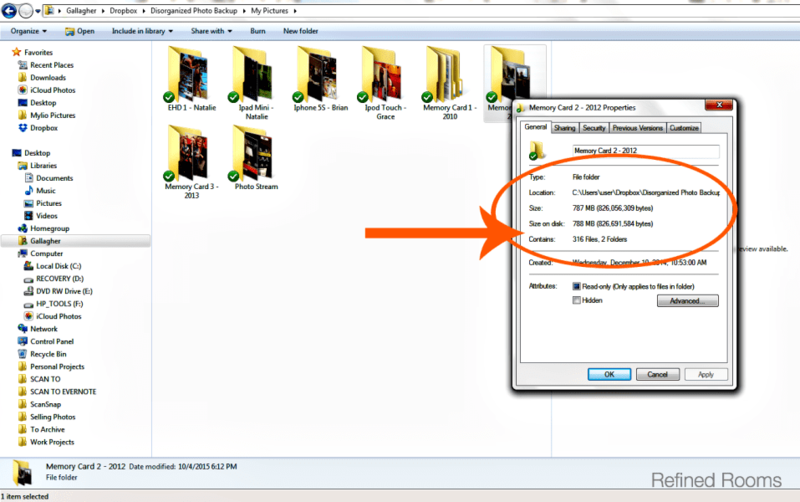 For example, in the sub-folder Memory Card 2 – 2012, my image count is 314 (316 minus 2 folders). This number is reflected in the spreadsheet above. Mac users can get the same information within Finder by selecting Get Info from the File menu for a specific subfolder. Oh, and here’s a tool for converting megabytes to gigabytes that may come in handy as you complete your inventory. If you haven’t read the overview of the challenge do that first before starting to this week’s assignment. Come back to this post later in the week to let me know about your progress by leaving a comment at the bottom of the page or in my Facebook Group. 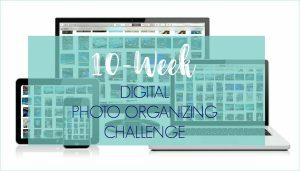 Let’s have a contest to see who has the LARGEST number of images in their collection to organize! Once you’ve completed your inventory, return to this post and leave your number in the comments section! ~ Happy Photo Organizing my Friends! Here is something I learned while going through the process. I’m not sure if this is the case for everyone, but my PC computer uses Windows 7. When I brought pictures over to my hub from Google Photos, they came over in zip files. Now in the hub on my computer I need to open each file up before I can determine how many files and GBs are in each. To do this, right click, then click “extract all”. This will create an uncompressed copy of the file. You can then delete the zipped file. Thanks so much for the tip Melissa. Excited to have you join the DPO Challenge! What an important step! I think most people really don’t know how many digital pictures they really have and if you don’t know what you have, it’s nearly impossible to get it under control. You know it Andi…I’m sure you had the same experiences as a photo organizer as I have. The photos are never centralized one one device, and people usually underestimate the size of their collection. This step is crucial.